Premium articles in our blog are restricted to CMWM patients. See clinic for access. Nutrition, diet and health blogs by CalMWM Head Nutritionist Elaine Murphy (BA, CNS). For our patients. Healthy recipes and cooking advice by CalMWM Executive Chef (Shadow Chef) Jeff Huff. For our patients. The other day I discussed some Easter trivia but today I want to discuss this special day in a more serious tone. What do you normally think of when you think of Easter Sunday? Most Christians typically think of Christ dying on the cross on Good Friday and then rising from the dead on Easter morning. But like everything that usually has a spiritual meaning, the media has to put on a big blitz and stock the stores with chocolates and Easter baskets. How in the heck did a rabbit hiding Easter eggs become a part of Easter anyway??? Most of us really do know the importance of getting adequate amounts of sleep, especially related to weight loss. But, not obtaining enough sleep also increases the risk of other health problems, especially related to cardiovascular disease. The American Heart Association is a dedicated organization devoted to a world of longer, healthier lives, promoting its "Go Red for Women"movement. 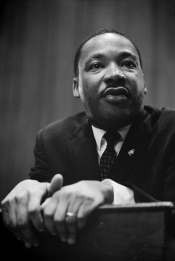 Today honors Martin King Jr.
Changing your Mind Can Change your Weight! Did you know when you are trying to be successful with something your brain literally works against you? Why is this? And how can you change it? Fulfill Your Goals in 2019! Like almost every January, this is a good time to consider any goals you are thinking about attaining in the next twelve months ahead. The other day I discussed holiday success and the effort it will take to stay diet compliant. But the reality is all dieters cheat now and then. What is the Price for Weight Loss in December?